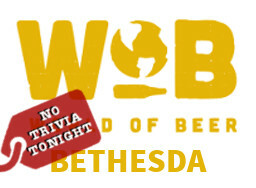 The hard working staff at World of Beer (Bethesda) deserves an awesome staff party! They'll be out celebrating, so trivia is off tonight (1.13). We'll be back next week! To get your trivia fix, listen up to the We Don't Know Either podcast and learn something interesting.